Swimia.com needs your feedback on Aquagym in Morocco to ensure all the knowledge about swimming in Morocco is valid. The finest Morocco Pools are located mainly in huge cities, but it's also easy to find public pools in rural areas. Please have a look at the pools swimmers like you could have reported near Morocco. Please, report any Morocco Swimming Pool not listed here. We probably don't know all the Pools in Morocco. Are you missing any? Contact us!. Not all countries are the same, and swimming rules and regulations are changing from one country to the other. 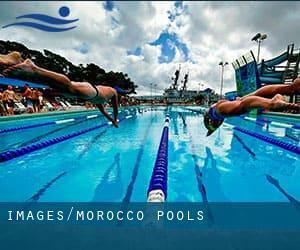 So, if this can be your initial time looking for Morocco Pools, make sure to contact the premises before you drop by. Swimming is a sport for all ages. It helps young people to tone their muscles and grow healthy and strong. For the elderly, there's no better way to workout than finding a Morocco Swimming Pool to escape from daily routine. Enjoy the best indoor pools in Morocco and don't worry about the weather. These facilities are open all seasons and you can enjoy a swim at the same temperature every day of the year. There are several reasons why you must choose a heated swimming pool in Morocco. Probably the most vital one relies on the importance of keeping the body temperature stable. When the water is too cold, your body will try to warm it up and you will lose strength to swim appropriately. One in the advantages of outdoor swimming in Morocco would be the possibility to sunbathe for the duration of the summer season. Taking it with additional care, sunbathing is healthy since introduces Vitamin D into the body, so the perfect option seems to be switching between indoor and outdoor pools depending on the season. It's difficult to visit Morocco with no dropping by Agadir (with 698.310 residents). Currently Swimia is showing you all the Swimming Pool in Agadir along with the closest pools located in its vicinity. Without a shadow of a doubt, swimming in Fes may be the best way to unwind after work. Take a couple of minutes to browse Swimia's catalog to find a Swimming Pool in Fes. Swimming is a excellent idea to keep your body active during your visit to Casablanca (Morocco), or even for anybody who is a local. Swimia helps you to find your closest Swimming Pool in Casablanca. Swimming is a wonderful concept to help keep your body active during your visit to Tangier (Morocco), or even if you are a local. Swimia helps you to find your closest Swimming Pool in Tangier. Let us tell you a secret to switch off though you will be in Marrakech: just choose a Swimming Pool in Marrakech and plunge into the water! There's no more successful technique. Holding an estimated population of 545.705, Meknes is one of the most important cities in Morocco. Check all the Swimming Pool in Meknes and its surrounding area. Holding an estimated population of 1.655.753, Rabat is one of the most important cities in Morocco. Check all of the Swimming Pool in Rabat and its surrounding area. Updated on 2019 Avenue Bab Jdid , Marrakech (Postal Code: 40000). This sports center delivers 21 meters x 13 meters, Outdoors. Contact information for this Swimming Pool which include phone number and e-mail address are number. Updated on 2019 Boulevard Arrahma Narjiss , Fez (Fes) . Among all the activities supplied by the center, when you are keen on swimming you can expect to delight in 25 meters x 15 meters, 6 lanes, 1.2 meters - 1.8 meters depth, 1.2 meters - 1.8 meters depth, Indoors. Just in case you want to contact this Swimming Pool before dropping by, we only know the phone number. Rue Mamoun Mohamed , Casablanca (Postal Code: 20050). Swimmers like you have reported Olympic size x 25 meters, 10 lanes, Indoors. Also, you will find 25 meters, 4 lanes, Indoors. Just in case you need to make contact with this Swimming Pool before dropping by, we only know the phone number. Boulevard de la Corniche , Aïn Diab , Casablanca (Postal Code: 20050). This sports center delivers 25 meters, Indoors. For this Swimming Pool, only phone number is number here. Updated on 2019 Km. 4 Route d´Amizmiz , Chrifia , Marrakech (Postal Code: 40000). Swimmers like you have reported 25 meters x 10 meters, 4 lanes, Indoors. Also, you will find 30 meters x 10 meters, Outdoors. Just in case you want to contact this Swimming Pool before dropping by, we only know the phone number.